Images courtesy of the creative folk Flickr CreativeCommons. Thanks! 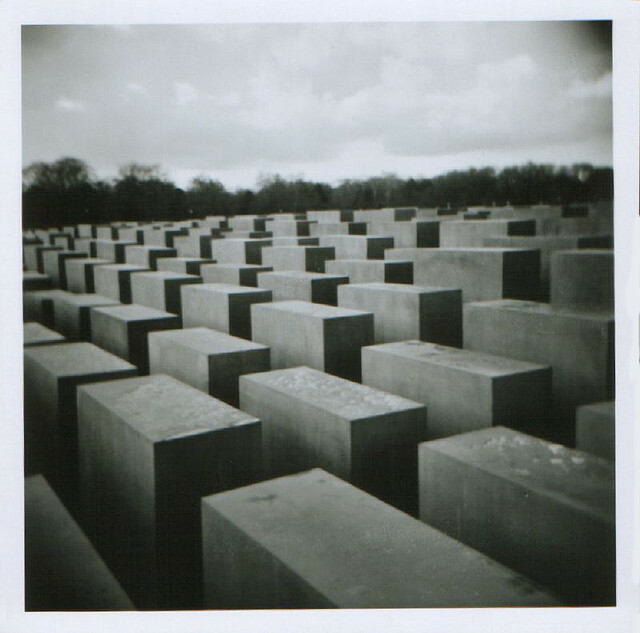 I have a strange emotional attachment to Berlin that's hard to explain. I first got to know the city when it was divided by a forbidding wall, the inevitable ground-zero for an ever-threatening World War Three. The city had a unique character, so political, so hanging on a knife's edge, like no other place on earth. 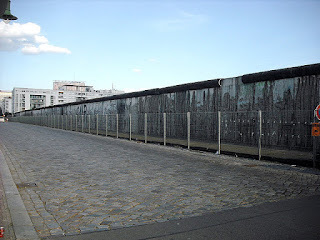 You could jump onto a subway in West Berlin, ride through closed-down stations in the east, manned by machine-gun-toting policemen, then later get out in West Berlin again. Above ground, any way you went, you'd run into the wall sooner or later: end of the line, locked in. Then came the sudden end of East Germany and the fall of the wall. After a flurry of activity rejoining streets, railroad tracks and neighborhoods, Berlin turned into just a normal city again. But it still managed to keep its own character. The eastern part of the city, once gray and lifeless, became the hub of hip new hangouts. The old city center, also in the east, filled back up with businesses and hotels to enliven the surrounding museums and monuments. It's well worth a visit. 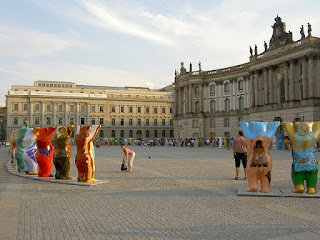 Here's a route that takes you on a loop through Berlin's heart, the Mitte, with all its scenic and historic spots: the city hall, the last bits of the old town, the cathedral, Humboldt University, the Gendarmenplatz, Checkpoint Charlie, along a remaining section of the Wall, through Potsdamer Platz, past the Hollocaust Memorial, the Brandenburger Gate, the Bundestag building, the Kanzleramt (Chancellor's office), along the Spree River, Unter den Linden, around the Museum Island and back to the start. We'll start the run in Berlin's busiest square, Alexanderplatz (or Alex for short). 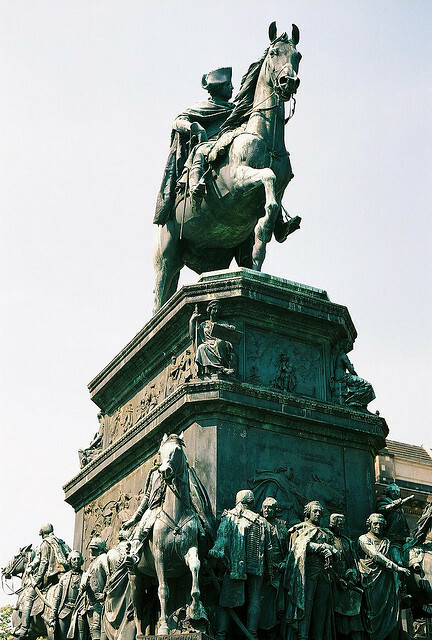 The square was named after a visit by Russian Czar Alexander I. 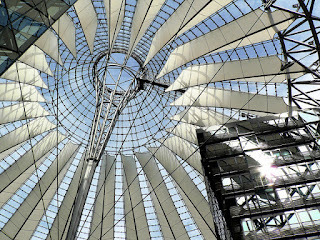 It is the biggest intersection of Berlin's public transit, with an above-ground station for the commuter S-Bahns, the U-Bahns down below, and the tram lines that cross the square. The shape and surroundings of the square have changed dramatically over the years. After Berlin was bombed-out during World War II, the area was rebuilt in East Germany's socialist style. But a construction boom after reunification has changed its face still again. 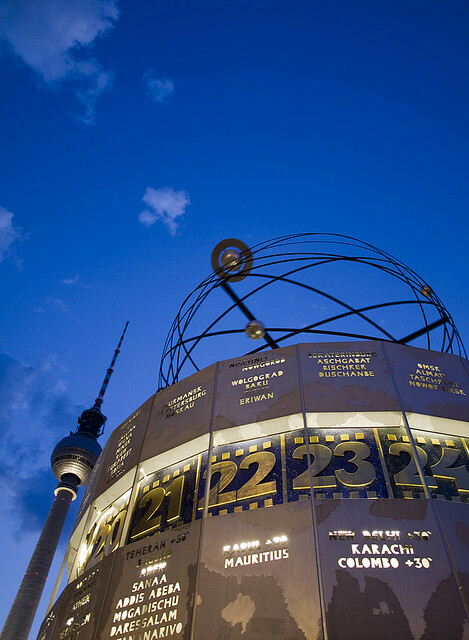 Start the run by standing at the World-Time Clock, from the East German period. I first stood here in about 1985, on a day trip to East Berlin while I was in town for the (West) Berlin Marathon. Here at Alexanderplatz, I ate a memorably bad meal with the world's most unfriendly service, after being totally ignored and refused service at another restaurant. My wife and I were pushing around a baby carriage, and the East Germans could recognize us as westerners immediately by our clothes and the style of the carriage. 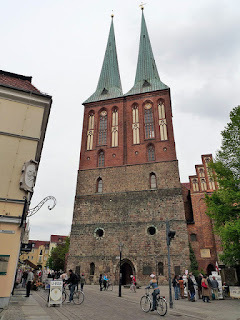 As day-visa-holders, we weren't allowed to travel outside the center of town, but we risked getting in trouble and paid the 10 East-German pennies each for S-Bahn tickets to the green suburbs of Köpenick. 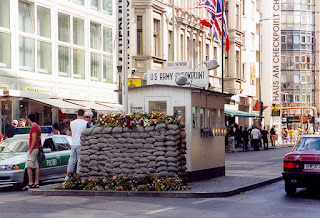 It was much more pleasant than walking around the center, where machine-gun-armed guards were watching over missle-trucks waiting for the East German DDR Jahrestag national holiday "Peace Parade" the following week. I definitely felt ill-at-ease, wondering if they would arrest me for being an American spy. In the newly restored Alexanderplatz, there are no more missle trucks. Everything is more relaxed these days, which is fine by me. 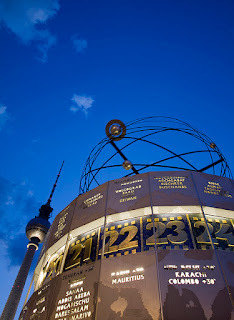 Turn westwards at the World-Time Clock to face the television tower and the overhead S-Bahn tracks. Run under the tracks towards the TV tower along Rathausstraße. The tower, with its distinctive silver ball, is a great landmark for finding your way back here again. You can go to the top and look out, well worth your time. When you pass the TV tower, turn to the right and run into the park just west of the tower. There is a big Neptune fountain here. 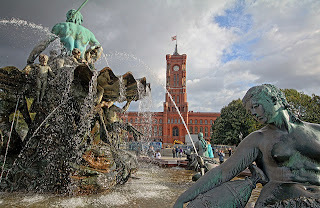 From the fountain, turn south to run to the City Hall (Rathaus), at the south edge of the park. The red-brick building is detailed with lots of interesting scenes from Berlin's history. Run west along the front of the building to turn left at the next street, Spandauer Straße. Turn right off of Spandauer Straße at the first little side-street, Am Nußbaum. This little lane brings you into the one last remnant of old Berlin, the Nikolaiviertel. Some of the houses are original, some were rebuilt during the socialist days, with varying efforts to keep the original look. You will come to the old St. Nikolai church, where you keep running, with the church to your left. You will run straight towards the statue of St. George and the dragon at the edge of the Spree River. So now you know where this little neighborhood is, and you can come back later to visit the little side-streets and maybe eat dinner in one of the restaurants here. At the river, turn right to run north, crossing Rathausstraße and running along the park again. In the middle of the park stand the statues of Marx and Engels, standing there a bit forlornly in the heart of this very capitalistic, modern city. To the left, across the river, is the never-ending construction site where once the Prussian royal palace (Schloß) stood. 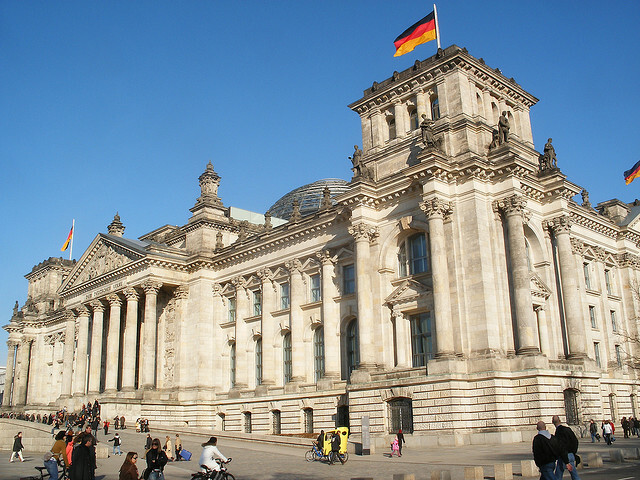 In the East German days, the bombed ruins of the palace were razed and a modern Palast der Republik was built in its place, with the East German parliament and a conference center. After reunification, the Palast der Republik was torn down because of its asbestos walls, but Germans weren't agreed on what to put in its place, on this historic spot. Many wanted to rebuild the royal palace, but others wanted to look to the future and build something more useful for the population. They finally decided on a compromise, with the main facade to be rebuilt in the old style, but the rest as a modern collection of museums and venues. But the start was postponed due to the big governmental deficits in 2010, and it is scheduled to begin in 2014. 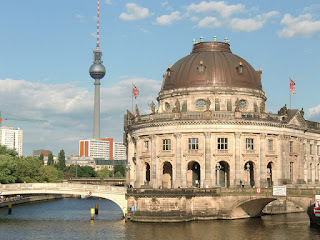 At the next bridge, turn left to cross the Spree and run by the Schloß site, with the domed-roof of the Berlin Cathedral across the street. You are now on the "Museum Island". Behind the cathedral to the right is a collection of world-class museums, beginning with the Altes Museum (Old Museum) just behind the park next to the cathedral. My favorite museum is the Pergamon Museum, with its beautiful Pergamon Temple and the astounding Ishtar Gate from Babylon, as well as a Roman forum gate. We'll run by all that later. But now, just keep running straight past the wierdly empty Schloßplatz. The only thing standing there now is the modernistic "Humboldt Box" info-stand, where you can learn about how it will one-day look. You quickly leave the island by crossing the beautiful Schloßbrücke bridge. You'll pass the old armory (Zeughaus) on the right, another museum where one of the failed assassination attempts on Hitler happened. 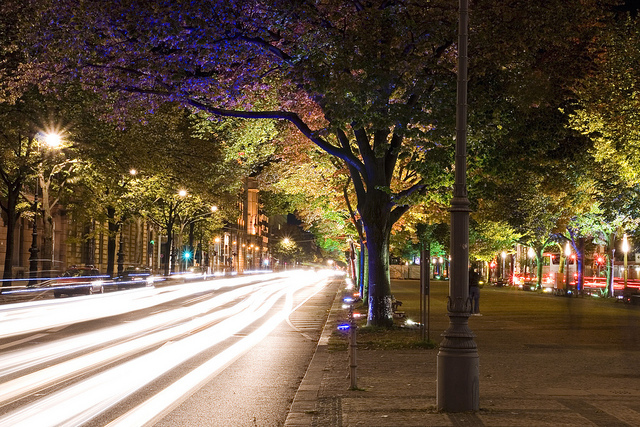 The street is called Unter den Linden from this point, one of the most famous in Germany. In a couple of blocks it turns into a tree-lined boulevard. In the East German days, it was lined with representative offices for things like the Bulgarian Ministry for Heavy Industry, always empty of visitors. The only shop worth visiting back then was a book shop: one of the bright spots of East Germany was its printing industry. The street is lined with one interesting spot after the other. Across from the armory is the old crown-prince's palace, then a nice café. 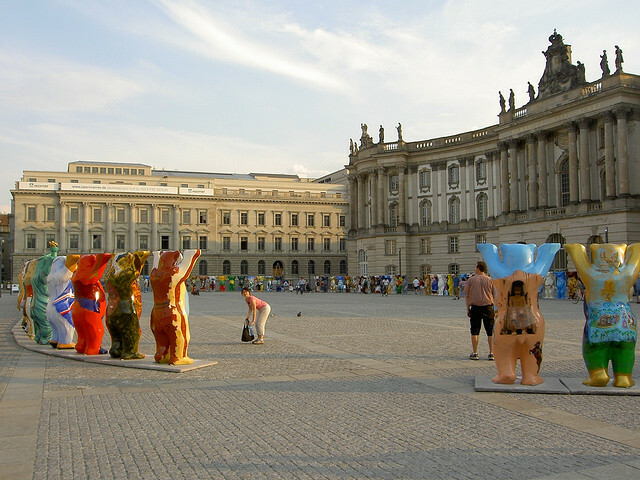 On the right, you'll pass the small guards' house, the Neue Wache, with its memorial to victims of the Nazi regime. In the East German days, impressively goose-stepping soldiers stood watch out front. Just past the memorial, you'll see Humboldt University on the right, named after the great German naturalist, who reformed the Prussian university system. On the left is the opera house, then the curving university library. At the spot where the trees begin, at the mounted statue of Frederick the Great, we'll turn left to run through Bebelplatz square, past the university library. Don't worry, we'll run back along part of Unter den Linden again later. Run south through Bebelplatz, in front of the library, exiting the square just to the right of the domed church in the back, St. Hedwig's Catholic Cathedral. 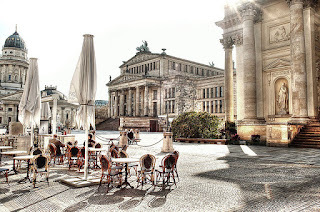 The lane ends in a block, where you turn right and run one more block to the Gendarmenmarkt, with its twin churches flanking the classical Konzerthaus. The French Cathedral on the right was erected for the many Hugonauts, who fled France for safety in protestant Prussia. Turn left to run straight south through the long square. 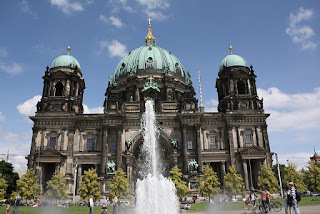 The second church, the Deutscher Dom, was still a ruins when I first saw it in my first trip to East Berlin. You'd never guess it now. At the end of the square, at Mohrenstraße, turn right to run two blocks to Friedrichstraße. This street has really come back to life, becoming the main shopping area for reunited Berlin. 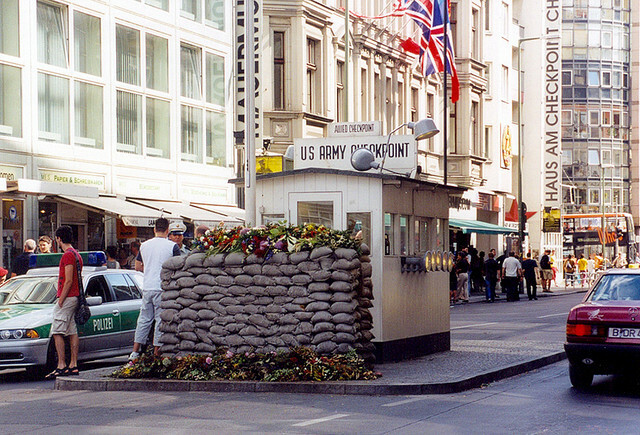 Turn left on Friedrichstraße and run the four blocks to Checkpoint Charlie. Beyond that spot, West Berlin began. The Berlin Wall ran right down the cross-street, Zimmerstraße. The checkpoint that you see now was re-erected, after the original was removed, much to the dismay of the many tourists. Turn right on Zimmerstraße and run along the old path of the wall. 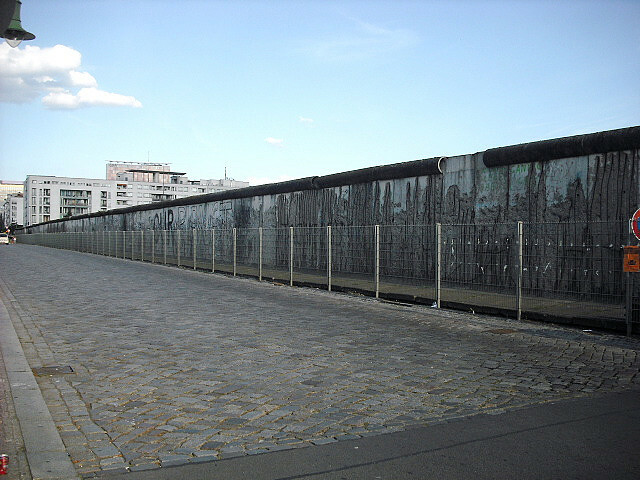 After a block, a remnant of the wall will flank the street along the left side. When the city was still divided, this street was a no-mans-land. To your right side, you are running behind the Finance Ministry and the Bundesrat (German Senate). 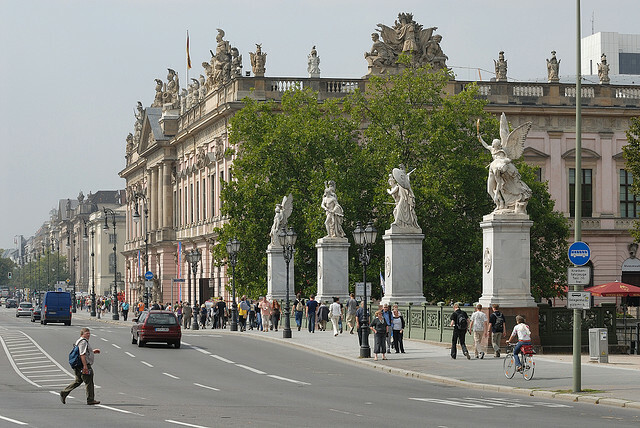 The Martin-Gropius-Bau Museum is on the left. The street ends at a neighborhood full of modern office buildings. This is the Potsdamer Platz neighborhood. The whole area was a big no-mans-land when the city was divided, empty and spooky. From wooden lookout towers in the west, you could look out over the wall, recognizing only the sealed subway station entrances in the barren expanse. After the wall came down, it became Europe's biggest construction site for years. Turn right and run right to the Potsdamer Platz intersection, with its strange traffic light. Turn left to run past the half-round Deutsche Bahn building, then turn right to run straight into the pointy glass-roofed Sony Center. Just run straight through the amazing space under the roof and exit on the other side. Run north past the last building in the Sony complex, where you will see the huge, wooded Tiergarten park ahead of you. The Tiergarten is a wonderful running route in itself, but we won't go there today. Turn right to run along the edge of the Tiergarten along Lennestraße, then turn north to keep running along the park edge on Ebertstraße. The wall also followed this street: the Tiergarten was in the west. After just a block, you'll come to the somber sight of the Hollocaust Memorial, with its sea of grey rectangular stones. It's a disturbing feeling walking through it, but fascinating. Keep running north on Ebertstraße, and you'll pass the Brandenburger Gate on the right. Before we run through it, we'll do a loop north of here, though. Keep running the one block north to the Bundestag building, the German parliament. Turn left to circle around to the front entrance, which you'll see when you turn the next corner, to the right. There is usually a line of people waiting to get inside to tour the glass dome on the roof, and it is worth a bit of waiting. 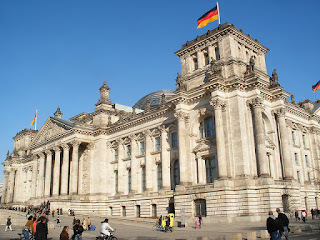 Run past the front, then turn left to run along the big plaza out front of the Bundestag. Across the way, on the right, you'll see a huge modern complex, the Bundeskanzler's office, at present, home of Angela Merkel. Keep running straight, with the Kanzleramt on your right, until you hit the Spree River. To the left, you'll see a modernistic, oyster-shaped concert hall, once donated by the American people to West Berlin, along with a carillon bell-tower. For many years, it stood empty, with the roof threatening to cave in, but it was repaired and put back into use again. Turn right here to run along the river, going behind the Kanzleramt. The river will curve to the right, tracing a half-circle, until you come to the backside of the Bundestag again. You'll see the new Berlin Central Station across the river. 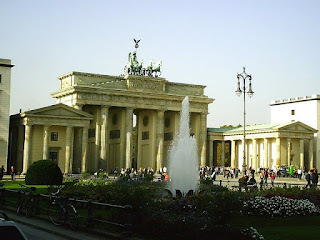 Now, leave the river and run behind the Bundestag straight south back to the Brandenburger Gate. And this time, turn left and run through the massive gates. Now you just run straight down Unter den Linden, either staying along one of the sidewalks or running down the middle of the tree-lined median strip. You'll pass the exclusive Adlon Hotel on the right, the British Embassy, then the impressive Russian (ex-Soviet) Embassy, built with stones taken from the old Kanzleramt, where Hitler's bunker was located. When you get back to the Armory and the bridge to the Museum Island, turn left before the bridge and run along Am Zeughaus past the museums across the river. When you get to the last museum, the Bode Museum, the island ends. Cross the bridge to the far side of the Spree and turn right to run back along the other side of the island. You will approach the cathedral from the backside this time. When you get to the big street again, Schloßplatz, cross the street, then turn left to run the last few blocks back to Alexanderplatz, past the Marienkirche church and the TV tower. You will run under the S-Bahn tracks at the station, then turn right to get back into Alexanderplatz itself. Thank you for this great run and the description of the many sights along the route! I ran this route on a sunny saturday morning in may 2014, and it was a great experience. In two places I found the road closed and had to find a detour: near the building site of the Scholssplatz and the stretch behind the Reichstag. A detour was easy to find, so no trouble at all. Thanks again and keep up the great work! Hi, Keith! It's Giulia from Venice, Italy. Great work you're doing here! I would like to be in touch with you with regards to these German running routes you shared. Do you have an email address I can write to? What is the distance of this run? The distance is listed at the top of the article, just below the "Click here for route map" link. Enjoy the run! Hi Keith, this is exactly what I was looking for as I prepare my trip to Germany. Do you have any maps of your routes? Hi Lauren, every route has a "Click here for route map" link, where you can get it at MapMyRoute. Enjoy Berlin!